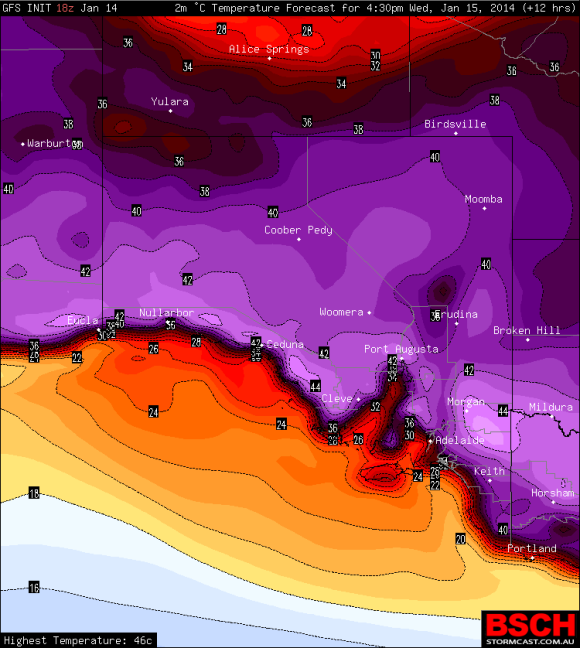 South Australia is recovering from a heatwave similar to what was experienced in autumn 2008 and spring 2009. Peak maximum temperatures recorded at Langhorne Creek's central weather station were been 44.4oC, five days in a row were above 40oC, and night time temperatures did not cool vines down with the temperature staying above 25oC from the 13th to 16th. The McLaren Vale Wine Region had peak temperatures above 43oC. Temperatures were also over 40oC in the Adelaide Hills, Clare and the Barossa. All of these temperatures are higher than the maximum temperature for a grapevine and they shut down most of their ripening and functions accordingly. Above: Heat map 16th January 2014. Each of our previous recent heatwaves had different consequences for our grapevines depending on what stage of the growing season they occurred. The November 2009 spring heatwave during flowering (EL-19 to 25) reduced berry set and yield. The March 2008 autumn heatwave interfered with ripening (EL-39) causing vines to panic ripen and affected fermentation. 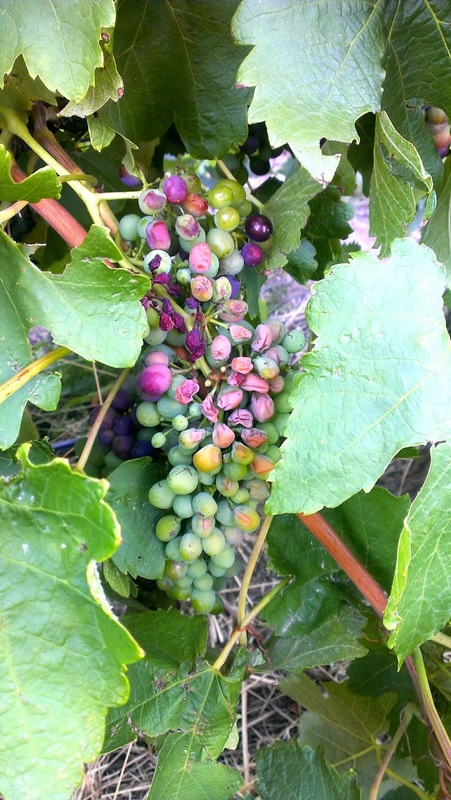 Our current heatwave has occurred as vineyards are going through Veraison (EL-35). Grapes become more susceptible to heat damage and sunburn as they soften and this is the biggest risk to your fruit from this week’s weather. Look also for leaf loss and defoliation. Most vineyards have lower leaf yellowing and some premature leaf loss. Above: Shrivel in Langhorne Creek Cabernet Sauvignon. Unfortunately Cabernet is sensitive to heat stress. This may not directly affect fruit quality but it will affect fruit quantity. Above: Defoliation from toxic levels of salt - 17/1/2014. This is a serious plant health issue. Above: Cooked Shiraz McLaren Vale South Australia - 15/1/2014. Grapevine bunches in direct sunlight or partial shade get much hotter than the surrounding air temperature. The temperature inside the bunch spikes to over 60oC and berry cells breakdown ‘cooking’ the fruit. The three symptoms above have been seen already, with sunburn particularly in vineyards on light sandy soil where the ground reflects heat back into the grapevine canopy, salt around treelines and shrivel in sensitive varities. Fruit on both the eastern and western sides of canopies has been burnt. At this stage yield loss varies from less than 1% to greater than 15%. Revise your yield estimates if necessary. What to do DURING the last days of the heatwave: Apply irrigation to maintain soil moisture at a level that enables vines to regain their turgor overnight in preparation for the next hot day. What to do AFTER the heatwave: Irrigate to replace lost soil moisture and decrease soil temperature. Monitor for diseases that may have exploited damaged berries. Unfortunately if we get rain before harvest sun damaged berries can become infected by botrytis and other rots. Understandably heatwaves naturally control mildew diseases and insect pests. It is simply too hot on the outside of grapevine canopies for them to survive. It doesn’t complete kill all problems though. It may come as a surprise but active Light Brown Apple Moth and Powdery Mildew have been found inside tight bunches this week. Powdery has established colonies earlier in the season while Light Brown Apple Moth caterpillars are able to burrow away from the heat. Both are shielded from the temperatures inside tight bunches. It is not possible to get coverage into tight bunches now and any active pests or disease inside bunches can’t be controlled. 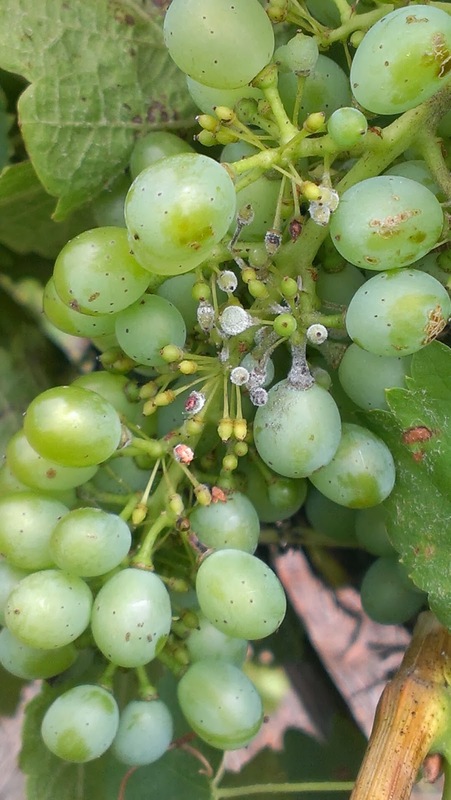 Above: Powdery Mildew on unset fruit. Be aware that if more hot weather occurs, more vine damage is likely. Deep irrigation and allowing your grapvines to recover at night will be vital.